Type: EQUIPMENT. Detail: WOOD_SETS. Product Code: WCM18B325B. Brown wooden pieces and cream coloured pieces. The king is the tallest piece at 3.25 inches or 8.2 cm. 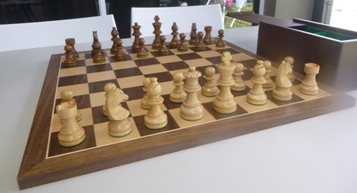 This elegant chess set is seen here on a Walnut board (NSP50450) which is sold seperately $99.